MANILA:Imelda Marcos was found guilty of corruption yesterday and handed a lengthy prison term in a rare conviction for the former Philippine first lady accused with her late dictator husband of embezzling billions of dollars from state coffers. 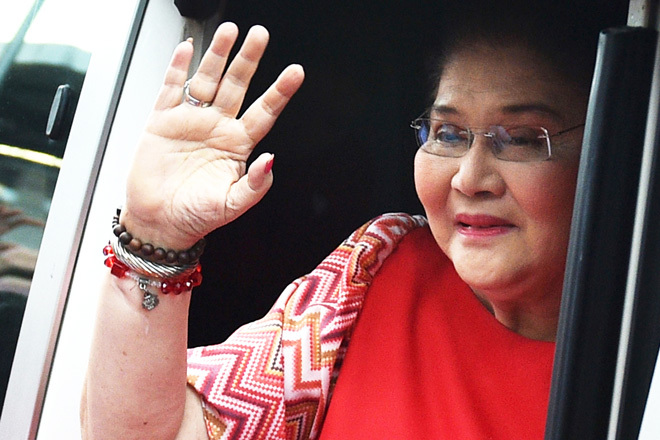 The verdict from the anti-graft Sandiganbayan court orders her to serve a minimum of six years behind bars for each of the seven charges that the Marcoses funnelled roughly US$200 million through Swiss foundations decades ago. Ferdinand Marcos, who along with his cronies was accused of pilfering US$10 billion from the Philippines, fled with his family to the US after a peoples uprising ended his 20-year rule in 1986. The couple opened all those accounts in Switzerland, and they used pseudonyms to hide their ownership. The president chose William Saunders and Imelda Marcos used Jane Ryan, special prosecutor Ryan Quilala told reporters. This points to how long and therefore frustrating the Philippine judicial system is, said opposition lawmaker Francis Pangilinan. We hope our courts will see this through… and give no special treatment to Mrs Marcos, he added. Court officials said Marcos, who was not at yesterdays hearing, would be able to avoid incarceration by posting an as yet undetermined bail. She has the right to appeal her conviction to the Supreme Court.